My wife (who somehow gets along just fine without an avatar) would tell you that it was bound to happen. 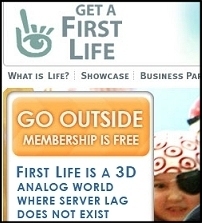 Somebody put together a dead-on parody of the Second Life home page advertising your “First Life.” (You know, the one where you eat stuff and can’t fly). Since the author is “commenting,” the theory goes, there is a policy justification for the use of the older work. See Campbell v. Acuff-Rose Music, Inc.
As the page is a parody, it would likely be considered “fair use” if Linden Lab tried to make an issue of it. So the author’s suggestion that the link to his blog be used for “comments and cease and desist letters” is best taken with a grain of salt.